This PDF 1.5 document has been generated by PScript5.dll Version 5.2.2 / Acrobat Distiller 9.0.0 (Windows), and has been sent on pdf-archive.com on 10/08/2013 at 00:17, from IP address 208.31.x.x. The current document download page has been viewed 509 times. File size: 35 KB (3 pages). new and/or existing Projects manufactured in the Architectural Terra Cotta Façade Division. and other sales and/or related duties. physical Terra Cotta samples. Three (3) years minimum experience in AutoCAD is desired. Experience with Autodesk Inventor is desired but not required. Project Schedules: Responsible for the creation, analysis, implementation, and maintenance of Project schedules. Change Orders: Prepares and issues estimates for Change Orders for in-house review, approval, and signature. 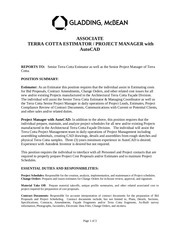 project required for preparation of cost proposals. information, Photographs, facsimiles, Electronic Data Files, Change Orders, and etcetera. the project specifications required to prepare accurate cost proposals, contract amendments, and/or change orders. change orders, revisions, amendments, changes in scope. Intercommunications: Interface with Sales and Drafting, and Production on a daily basis. Safety: Comply with all company and OSHA safety rules and regulations for in plant and on project site. from Division requirements within Gladding McBean. (5) years in Estimating and Scheduling of construction related work projects. High School diploma or equivalent accredited certification of completion. take off’s. In addition, a minimum of five (5) years of scheduling experience in construction related projects. Experience in construction sales or contracting sales is a plus. Communications: Excellent verbal and written English skills. reviewing skills with emphasis in recognizing detailed information within the plans to identify project scope. information within the contract documents. and/or Production. Project Costing and inventory control experience is a plus. estimates in the event it is required by Contract or Project. daily basis to successfully perform the essential functions of this job. office environment. However, there are opportunities where the following could be encountered. mobility requirements for each Project. This file has been shared by a user of PDF Archive. Document ID: 00116931.